Human CD155, His Tag (CD5-H5223) is expressed from human 293 cells (HEK293). It contains AA Trp 21 - Asn 343 (Accession # NP_006496.2). The protein has a calculated MW of 28.0 kDa. The protein migrates as 55-65 kDa under reducing (R) condition (SDS-PAGE) due to glycosylation. Human CD155, His Tag on SDS-PAGE under reducing (R) condition. The gel was stained overnight with Coomassie Blue. The purity of the protein is greater than 95%. Authors: Chandramohan V, et al. CD155 is a Type I transmembrane glycoprotein in the immunoglobulin superfamily. Commonly known as Poliovirus Receptor (PVR) due to its involvement in the cellular poliovirus infection in primates, CD155's normal cellular function is in the establishment of intercellular adherens junctions between epithelial cells. CD155/PVR was originally isolated based on its ability to mediate polio virus attachment to host cells. 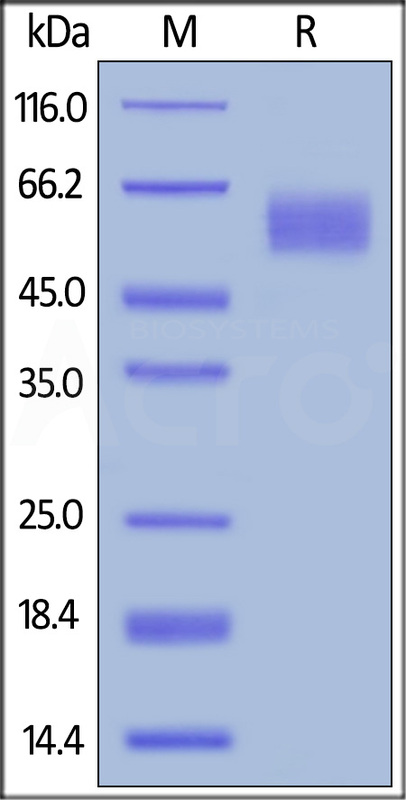 The fulllength (or CD155 alpha isoform) is synthesized as a 417 amino acid (aa) precursor that contains a 20 aa signal sequence, a 323 aa extracellular region, a 24 aa TM segment and a 50 aa cytoplasmic tail. The extracellular region contains one N terminal V type and two C2 type Ig like domains. CD155 is a transmembrane protein with 3 extracellular immunoglobulin-like domains, D1-D3, where D1 is recognized by the virus. Low resolution structures of CD155 complexed with poliovirus have been obtained using electron microscopy while a high resolution structures of theectodomain D1 and D2 of CD155 were solved by x-ray crystallography. (1) Mendelsohn CL, Wimmer E, Racaniello VR, 1989, Cell 56 (5): 855–65 . (2) Maier MK, Seth S, Czeloth N, et al., 2007, European Journal of Immunology 37 (8): 2214. (3) Koike, H. et al., 1990, EMBO J. 9:3217. (4) Zhang P, Mueller S, Morais MC. Proc. Natl. Acad. Sci. U.S.A. 105 (47): 18284–9.